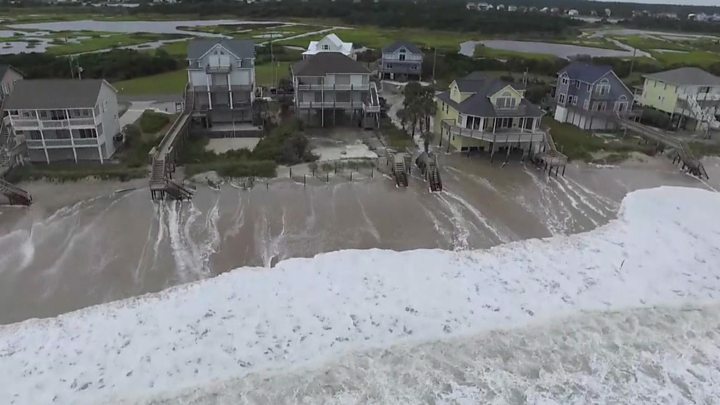 Hurricane Florence has made landfall on the US East Coast, bringing with it winds, heavy rains and warnings of “catastrophic” floods. Its outer bands have already inundated coastal areas. Scores of people are currently waiting to be rescued in the city of New Bern. Evacuation warnings are in place for more than a million people. Where will the storm hit? The governor of North Carolina said surviving the storm would be a test of “endurance, teamwork, common sense, and patience”. Thousands of miles away meanwhile a huge typhoon is moving towards the Philippines. More than five million people are in the path of Super Typhoon Mangkhut, officials say. 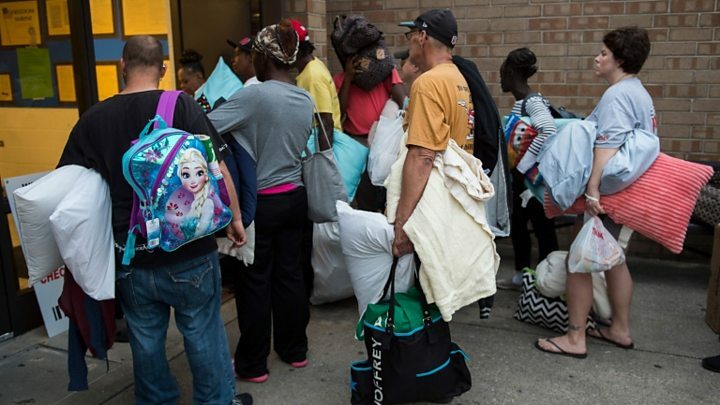 More than a million people have been ordered to leave the coasts of the Carolinas and Virginia, with more than 12,000 taking refuge in emergency shelters. More than 150,000 people already without power, but energy companies warn up to three million homes and businesses could also lose power. Officials have warned restoring electricity could take days or even weeks. Petrol stations in the area are also reporting shortages. Parts of New Bern, North Carolina, are 3m (10 feet) underwater and 150 people are waiting to be rescued, authorities there said. Davice Daniels from the New Bern Police Department said those unable to leave their homes should move up to higher floors. Latest predictions show the storm slowing to a near standstill as it pummels the coast with “copious amounts of rain” from Thursday night to Saturday. Are you in the area? How are you preparing for the hurricane? If it is safe to do so please tell us about your situation by emailing haveyoursay@bbc.co.uk.